US consumers are more happy to read marketing emails than ever before. 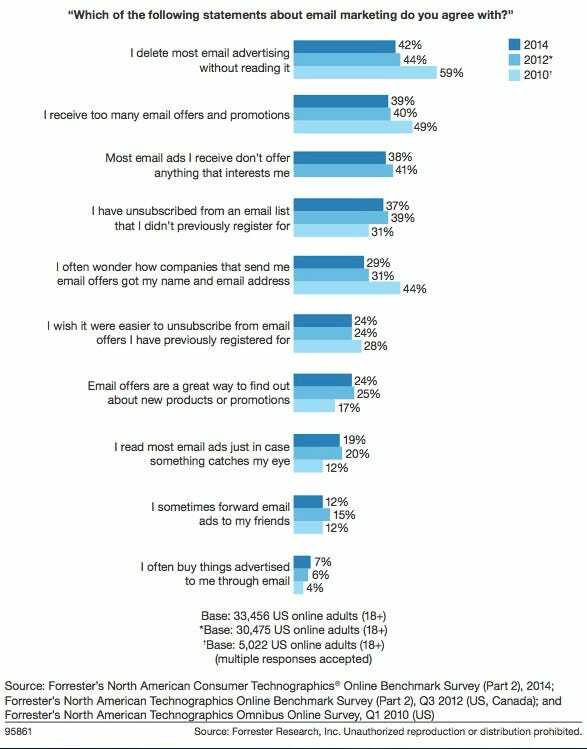 ForresterForrester research found US consumers are becoming more positive about email marketing. So why the change of heart? One ad body thinks it has the answer: people’s obsession with their phones. 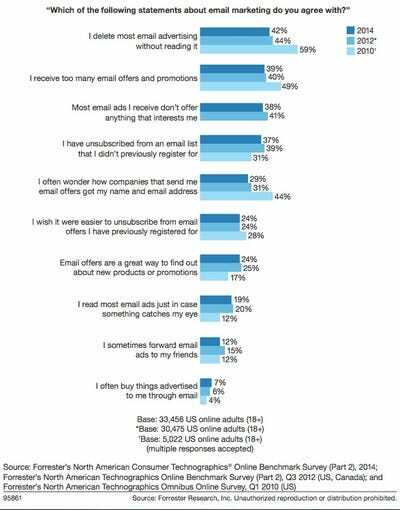 In 2010 half (49%) of US online consumers said they received too many email offers and promotions. That’s now down to 39%. One in five (19%) of those polled even said they read every email newsletter they receive just to see if something’s on offer. Fewer people are also sending marketing emails straight to the trash basket. Just 42% delete promo emails without looking, down from 59% four years ago. We spoke to Tim Elkington, chief strategy officer at the Interactive Advertising Bureau (IAB)’s UK branch. IAB UK also ran a study on UK consumer attitudes to marketing emails in November 2013, which yielded similar results. It might also be because, over time, marketers have gotten their act together. The spam you’re receiving is probably more highly targeted and relevant than before, and you probably requested it from your favourite companies. Added to that, email services are becoming more sophisticated and filtering out the worst of the spam for us, Forrester suggests. Forrester polled more than 35,000 North American consumers as part of its North American Technographics Online Benchmark Survey.